A list of our favorite preschool games - ones that our kiddos ask to play over and over. Several of these are listed throughout the curriculum. Also included are games suggested by the ABCJLM family. These games require no reading making them perfect for preschoolers. Candy Land - Classic game for teaching colors, 1:1 correspondence, and taking turns. Colorama - A fun game to learn shapes and colors. Card Games - We love to play Go Fish, Old Maid, Crazy 8, Slapjack and other fun card games in the evenings as a family. Sorry - Excellent game to teach character! Child must be able to do 1:1 correspondence. Qwirkle - While by the game rules this game is too difficult for preschoolers, simpler rules can be used for great fun and learning. Ideas in the 5 Year Curriculum. Twister - While the real game will probably be too hard for preschoolers, have fun matching colors and body parts. This game is used in the curriculum as a Gross Motor Activity. Hi Ho Cherry-O - Basic math skills. Dominoes - Use for matching, math, counting, colors, and sorting. Picture dominoes are also available for younger kiddos. Connect Four - Fun fine motor game to work on colors, matching, and strategy. Memory - There are many options of this game (also called Matching) from Disney to faces, letters to Dr. Seuss. Or here are directions to make your own. Wonderful for Visual Perception, matching, memory, and taking turns. UNO Cards - These cards can be used for many activities including teaching numbers, colors, and sorting. The game is fun too! Cootie - Great fine motor activity! ABCJLM Bingo Cards - Printable in pdf form. Lucky Ducks - Sadly this game is no longer available but definitely grab if you see at Goodwill or a garage sale. Teaches matching, memory, and colors. Zingo - Several versions of this bingo-style game are available for pre-readers and readers to teach vocabulary, sight words, numbers, spelling, and other learning. Sequence for Kids - This was a favorite of our kids. 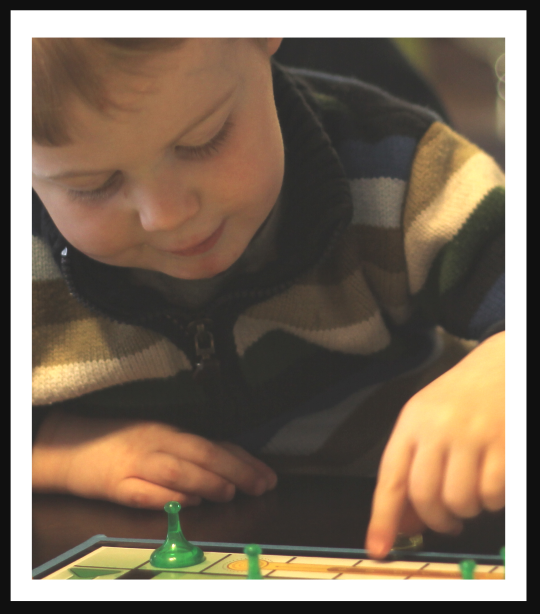 Great strategy-building game for older preschoolers. Qwirkle is one of our favorite games to play as a family and is an excellent game to teach sorting as groups can be created by color or by shape. Since the actual rules of the game are too hard for preschool children, the 5 Year Curriculum contains game alternatives. Uno Moo! My nieces love this game that teaches animals and their sounds, colors, and matching. Chutes and Ladders - Honestly, this is my least favorite of all children's games because it never ends but kids like it. Good for teaching direction, counting, and numbers. Spot It - Fun Visual Perception game. Get's Go Fishing - This game takes more fine motor skill than others so use with older preschoolers. Hungry Hungry Hippos - Other than basic game skills, not tons of learning. Frantic game that everyone plays at ones. Don't Break the Ice - One to watch for at thrift stores and garage sales. Stack Up! - For teaching color matching and hand-eye cordination. The Sneaky, Snacky, Squirrel Game - This game has been suggested by several for learning colors, matching, strategic thinking, hand-eye coordination, and fine motor skills. Don't Spill the Beans - Works fine motor skills. Trouble - Good game to play in the car. Teaches 1:1 correspondence. For older preschoolers.